Everything that you need for when you are watching your favorite team! 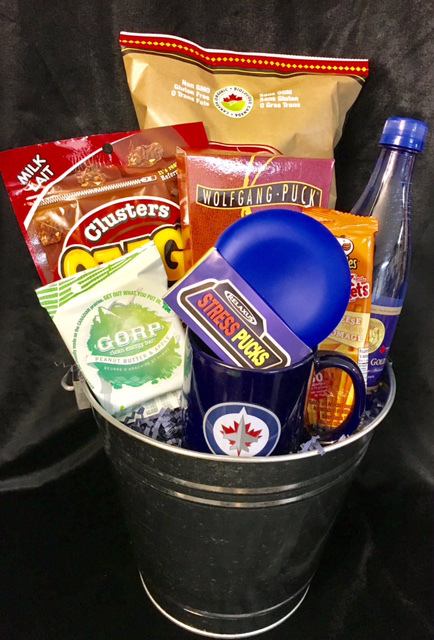 Hardbite Potato chips, OMG's Chocolate, Wolfgang "Puck" coffee, Pepperoni Sticks, Canadian Gold Water, GORP Energy Bar (the official Winnipeg Jets energy bar) a Jets mug and a stress puck for those close games! 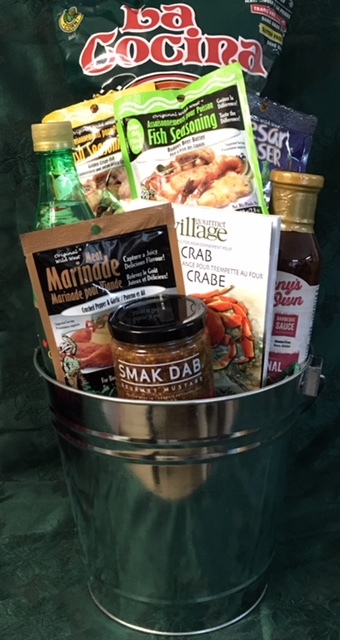 Great for your favorite BBQ aficionado, this basket will have you grilling with great flavors! Includes La Cocina Tortilla Chips to munch on while grilling, OMG's Chocolate Clusters, Smak Dab Canadian Maple Mustard, Danny's BBQ Sauce, Canadian Gold Sparkling Water, Wild West Meat Rub, Wild West Freddie's Famous Fish Seasoning, Wild West Golden Fish Fry, Wild West Caesar Pleaser (makes a clam tomato cocktail – great for making a glass or a pitcher). All in a metal bucket which can be used for chilling your favorite bevvy at the lake or in the backyard! If someone needs a pick me up or a Get Well wish, this gift is perfect! 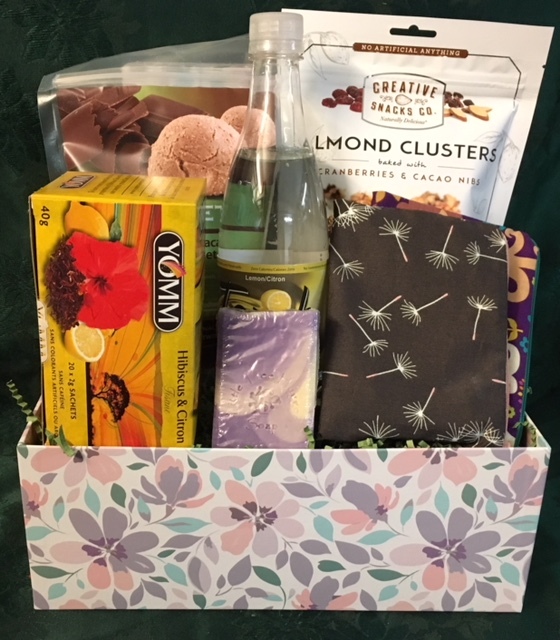 Contains Piccola Cucina Italian Macaroons, Simply Natural Sweet Potato Crisps, Lindt Truffles, Morden's Green Layer Mints, Little Tree Hugger handcrafted soap, Yomm Hibiscus Tea and a Tangle relax fidget to calm and sooth. Wrapped in sparkly cellophane and hand tied bow. A wonderful gift Just for Her! 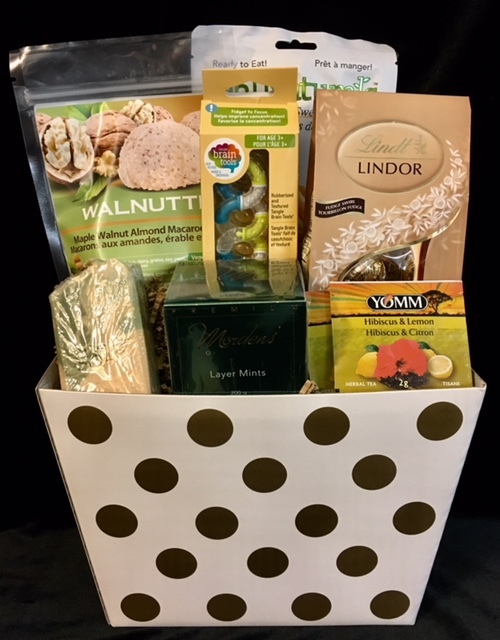 As a Thankyou, Happy Birthday, Get Well or Thinking of You, this luxurious basket is filled with useful and relaxing sure to please goodies. A delicious selection of premium fruits, fresh cheese, sweets, crackers and herbal tea. Great to send to an office as a treat for everyone. Local Winnipeg gift basket delivery only. 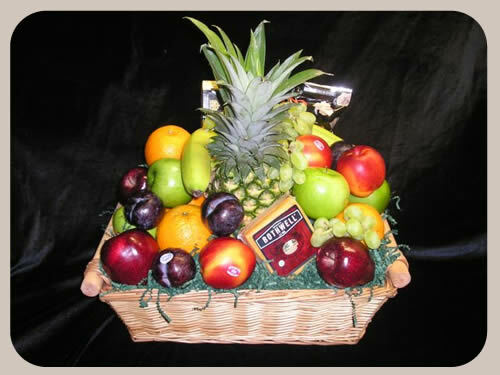 The ultimate snack basket to send to an office, as hospital ward or a snacking Get Well gift. 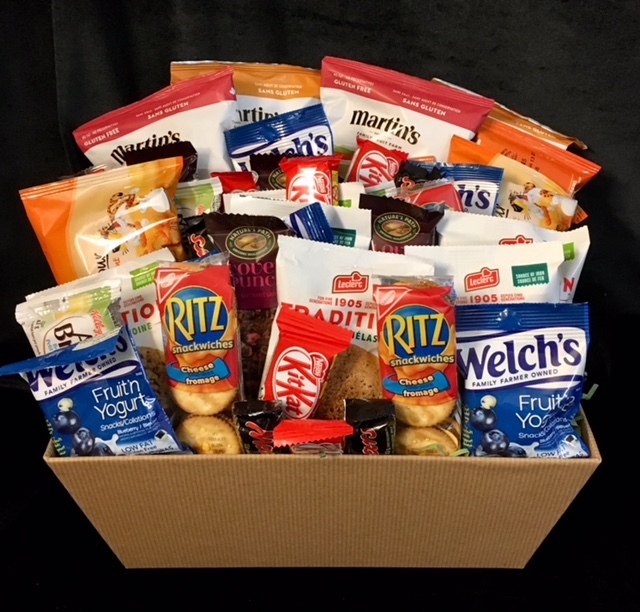 This basket contains an assortment of individually wrapped snacks so recipients can Grab & Go. Welcome the new addition with this basket that includes items for both mom and baby. A cuddly stuffed toy, sleepers, onesie, Colibri (formerly the Sling Sisters) Organic Sherpa Wash Cloths and a few treats for mom - YOMM Hibiscus tea, handmade SoGa Soap and a Gorp clean energy bar. Packed in a keepsake box and wrapped in boy or girl print cello. Girl and boy baskets available - please indicate gender when ordering. Stuffed toy and sleeper/onesie patterns may vary. Gift Certificates Available... Shipping to any location within Canada. Containers may vary in style from photo. We reserve the right to substitute products of equal or greater value. All prices do not include taxes, delivery or shipping. 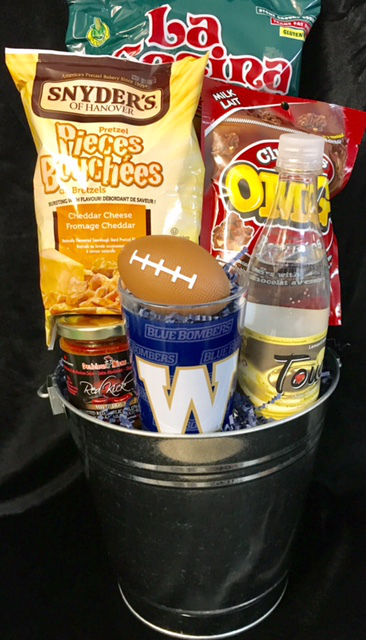 Contact us for a price quotation on your Custom Made "Best of Manitoba" Gift Basket.